Are you searching for Italian nicknames you can call someone? Because sometimes you need a nickname more remarkable than the ones in your native language, and who can blame you for searching for nicknames you can call someone in the Italian language? You would hardly find a list of the most romantic languages in the world that doesn’t rank the Italian language among the top three most romantic languages on Earth. So if you need an Italian nickname to call your boyfriend, girlfriend, father, mother, best friend, brother, classmates, or even nicknames for someone you don’t fancy all that much, we have gathered the cutest and funniest Italian nicknames you can call a guy or a lady. Also, we included cute and funny names you can call your boyfriend or Girlfriend in the Italian language. Because let’s face it, not many languages have fantastic nicknames for lovers like the Italian language. The following pet names are among the cutest nicknames the Italian language has to offer, so, if you need a cute nickname for that cute-looking guy, any of the following names would be great! Some of us don’t like cute; we prefer funny names. If you are one of those who loves calling people by funny nicknames, the following names are some of the funniest Italian nicknames for guys. Pinocchio (pinokkio) – For a guy who lies a lot. Like we earlier agreed, not many languages express love better than Italian. So, if you need a cute nickname you can call a girl in the Italian language, try any of the following nicknames. We have some funny nicknames for girls as well, so if you are looking for something not–cute to call a girl in Italian, these funny Italian nicknames for girls are the perfect fit. Lella – A funny Italian nickname for girls. Lessa – For a girl who’s always tired. Maestrina – For a girl who wants to teach others how to live their life. When you think about your girlfriend, the kind of love that fuels your thought is different from when you think about your sister, which is why we have created a different category to cover cute Italian nicknames you can call your girlfriend. Goofy lovers are the happiest lovers, do you agree? Well, if you prefer to call your girlfriend a funny nickname, then the following are funniest Italian nicknames you can call her. Don’t worry; he won’t give you a funny look when you call him by these names. He won’t say they are cheesy, because these cute Italian boyfriend nicknames are endearing and you can’t say these names without passion. Hi goofy girlfriend, these funny Italian nicknames for boyfriends are exactly what you have been searching for. Now, you have over two hundred Italian nicknames to choose from, surely, you can put them to good use. 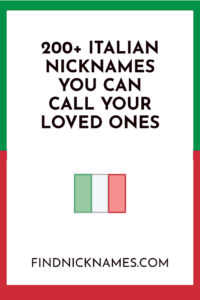 You could use these nicknames as contact names for your loved ones, as pet names to call them or maybe just a name to call your Italian friend. If you know any awesome Italian nickname, we missed out on, kindly write the nickname alongside its meaning in the comment section below. One more thing, we need to get the word out, so if you know anyone that could find this list of nicknames useful, go ahead and share it with them. Here you go Seema: 200+ Turkish Nicknames for Guys and Girls.